Being a Studio Ghibli production, I knew watching WHISPER OF THE HEART wouldn’t be a waste of time. 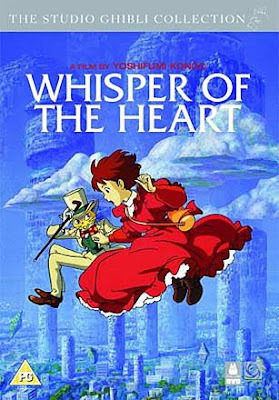 Directed by Yoshifumi Kondô and written by anime superstar Hayao Miyazaki, WHISPER OF THE HEART is a coming-of-age story about a girl named Shizuku. An avid reader and passive rebel against mainstream education, Shizuku’s mind is filled with fairy tales and romantic notions. One day she notices that the same person, Seiji Amasawa, has previously checked out the same books as her. This, of course, piques her interest and she becomes determined to find this Seiji Amasawa. Eventually, the two meet and it quickly becomes apparent that they’re kindred spirits. WHISPER OF THE HEART is the type of animated film that transcends age barriers. If you’ve ever questioned your purpose in life and felt less adequate than your peers, this film will resonate with you. Shizuku doesn’t know what she wants to do with her life. She’s only in Junior High but must choose a High School that corresponds with her proposed career choice. In reality, the pressure children face when having to decide their life path can be soul-crushing. WHISPER OF THE HEART would be a good film for today’s children to watch. Because kids have to choose their proposed career paths at such young ages, this film is still relevant and poses an interesting social critique. Shizuku and Seiji are strong role models with thought provoking dilemmas. There is also a spin-off film, THE CAT RETURNS (2002), which features the Baron, a mystical cat statute that captivates Shizuku. After seeing WHISPER OF THE HEART, you’ll definitely want to see THE CAT RETURNS. Shizuku and Seiji live the ideal childhood – the kind filled with wonder, mystery and romance. Everything that happens to them is romantic and character defining. The story is captivating. Of course, the film has corny dialogue – anime wouldn’t be the same without it, but I found myself smiling rather than cringing. Charming and nostalgic with just the right amount of cheese, there’s something endearing about the whole film that makes it a must-see for fans of anime.